Since our application to become self-regulated under the Regulated Health Professions Act (RHPA) was approved in 2015, MTAM has grown considerably in membership. There are many of our newer members who may not yet be up-to-date on our progress toward being regulated or even how we as an Association decided work towards being a regulated health profession. A REGULATION FAQ document will be finalized in the coming days and will be posted here as a resource to members and the public. March 1, 2019 - Massage therapy is regulated in P.E.I. Massage Therapy has been included as a Regulated Health Profession under the Prince Edward Island Regulated Health Professions Act. This means that individuals practicing massage therapy in P.E.I. will, as of today, be considered regulated health professionals, and new applicants would need to apply with the College of Massage Therapists of P.E.I. which is currently being formed. MTAM would like to congratulate our friends and colleagues at the Prince Edward Island Massage Therapy Association on this great achievement! The MTAM's Regulation Update presentation to our members made it's way across Manitoba. Members had a chance to ask questions which allowed us to make the presentation more comprehensive as we went along. Resource documents will be created and posted here which include the most relevant and useful information for members and the public. In the mean time, the MTAM continues to work with the department of Health, Seniors and Active Living to complete the RHPA Workbook which all of the other health care professions are working with or have already completed as they are brought in to the RHPA. All of the associations from across Manitoba who represent RMT's met together at the end of January with the Honourable Kelvin Goertzen, Minister of Health, Seniors and Active Living to discuss Regulation of Massage Therapy under The Regulated Health Professions Act. 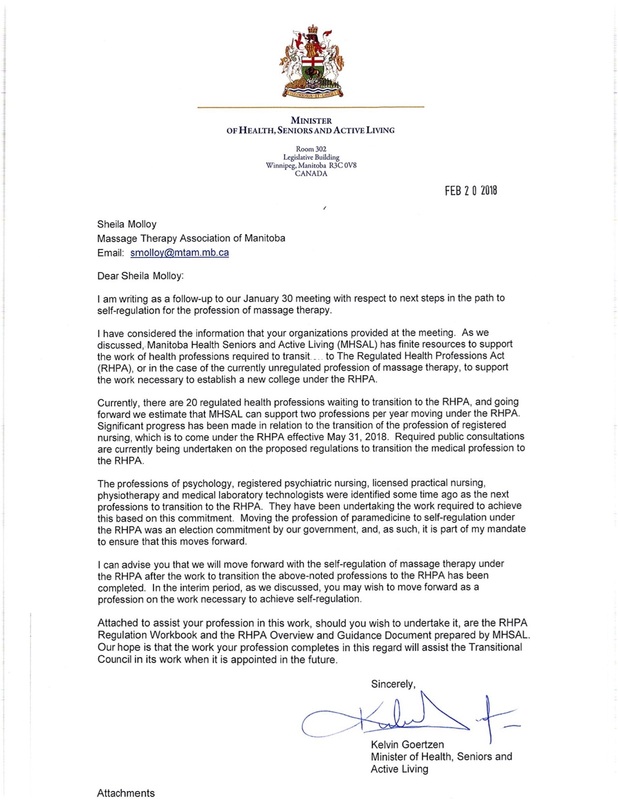 A letter was sent shortly after outlining where we are in the path to the RHPA and to suggest next steps. Obviously, a few questions came to mind so the MTAM was given clarification and more information following this letter. Currently, a more formal response letter is being prepared to send to the Minister but overall the MTAM Board of Directors was pleased with the confirmation that regulation is moving forward and with the steps suggested by the Minister's Office.